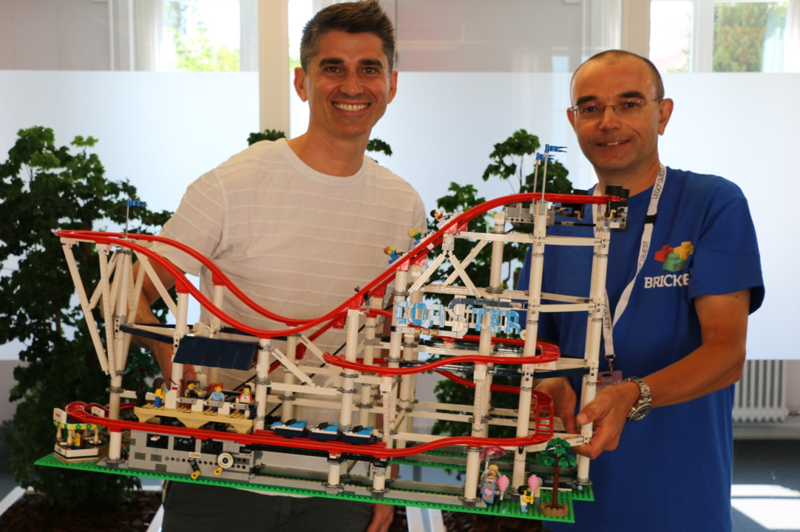 Brickset was invited to interview several LEGO designers during the summer, including Jamie Berard who has created such wonderful sets as 10182 Cafe Corner and 10261 Roller Coaster. In fact, the first part of our interview focuses upon that 4124-piece Fairground set. Brickset: How did you come to work for LEGO and what is your role within the company now? Jamie: My name is Jamie Berard and I am a Design Manager Specialist for LEGO Creator, Creator Expert and Architecture so I have two different groups to work with. I have been working for LEGO for around twelve and a half years but am originally from Boston in the United States. My background is as a LEGO fan and that is what got me into the company. I believe you were among the first AFOL designers. Is that correct? Yes. I actually wondered whether LEGO had deliberately sought to hire an adult fan when I was chosen but subsequently found that there were many more fans in Billund than I was expecting. 10261 Roller Coaster has proven popular and is the latest addition to the Fairground subtheme. How did the range come about? I was hired after showing a fairground that I had created for a fan event and many LEGO employees expressed an interest in a large Ferris Wheel that was displayed behind my desk. It was a great conversation-starter and planted the idea that official fairground sets might be appealing. It was only when I had fresh eyes from the design team that they actually looked at it and decided there was some potential so asked me to build something. That inspired 10244 Fairground Mixer! The set was very appealing so a lot of people bought into the idea and then asked for more of the same. I laid out the different icons of a fairground and suggested that we could extend this series for several years and that is what we have been doing since. 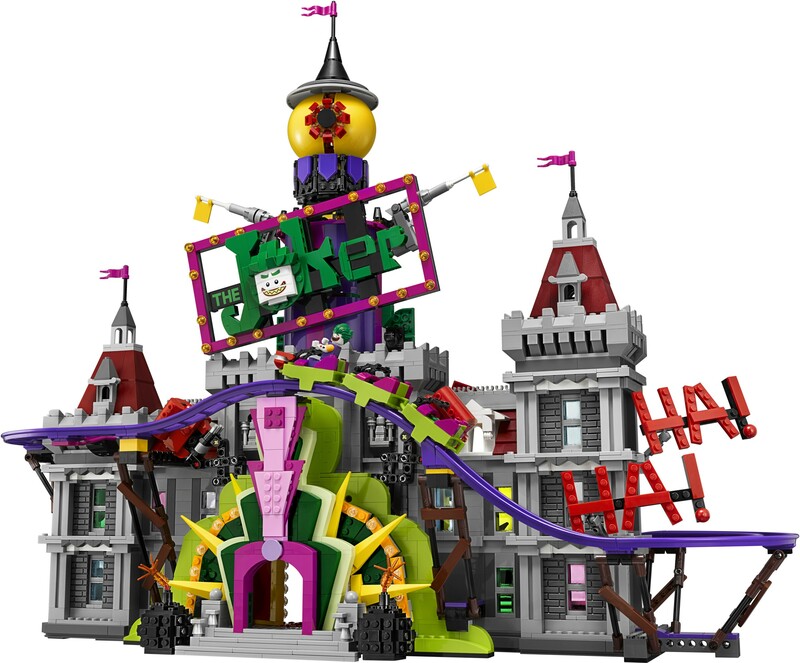 We first saw pictures of the new roller coaster track with 70922 Joker Manor last year. How did the track come about and was it designed with this set in mind? Yes, it was created for 10261 Roller Coaster which is supposed to be the flagship for the entire track system. It was only later on that the Batman set came along and we saw an opportunity to use it there as well. 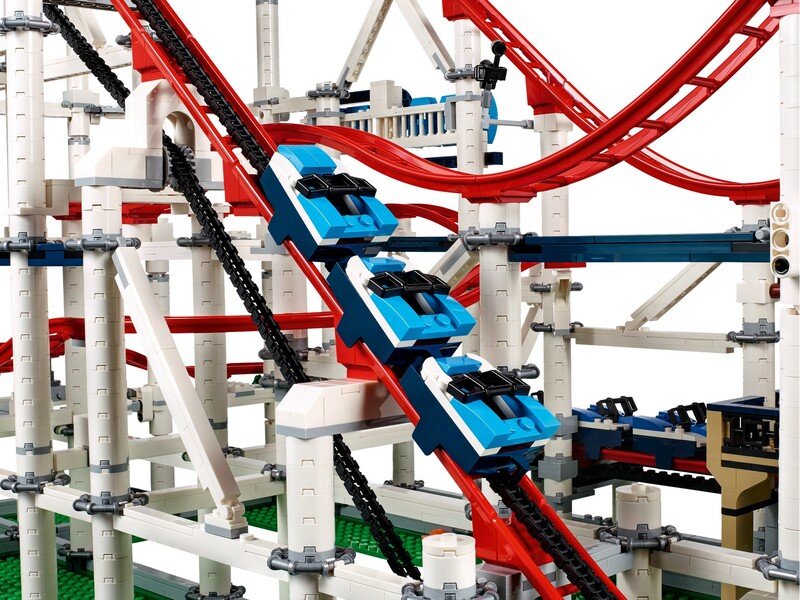 LEGO wanted the track system to be flexible enough for kids and understood by them but then also expandable so it would also appeal to adults. For instance, we included the chain lift with our adult fans in mind but that was not actually part of the original idea. During development decided that a roller coaster required a chain lift and that was one of the most challenging parts to develop. It is a very fine line between the chain grabbing the tabs underneath the roller coaster wagons and the rest of the element. I like how the system can be adapted for multiple users and we did not design this purely for children but they can still understand it with ease. In that respect, the track system has been incredibly successful. What concessions or design changes did you need to make in relation to the chain lift system? We ended up using a tab mechanism but stepped away from that several times during development. It is a challenge when you have so many different chain links as there are tolerances and things that add up, plus you need to some flexibility between the wagons because they must be able to twist and turn so you cannot use a normal connector. For example, the reason we have three cars on it is because the first car wants to pull back when it is going up the hill. The weight of the minifigure, especially those with a heavy hair piece, may cause the car to tip backwards and separate the pin from the chain. However, the weight begins to equalise when you add a second wagon. The third one then balances the entire train so three cars are best because it works well for the lift chain. Were these the most complicated aspects of designing the model? Not necessarily, I would also mention how the wagons attach to the track. A gravity driven system can be limiting when you wish to detach the cars from the track as there needs to be a balance between a firm grip on the track and ease of removal. Creating a low friction wheel set that was made of plastic was also quite difficult as we did not want to use metal. Hopefully the final model works perfectly for everyone! Yes, we think it’s fantastic! 10261 Roller Coaster is obviously enormous but is constructed on several relatively small plates rather than large baseplates and this appears to be a consistent trend in recent years. Why is that? I think there are a couple of reasons, the first being that they are not entirely 'on grid'. They are not truly in the LEGO System because of their height which is not quite a half plate. Furthermore, they are more flexible than standard plates and that can make it difficult to lift large models so if we were to use them, the roller coaster may separate from its base. I think that is because we vacuum form the plates rather than moulding and moulding allows much more control over the clutch power of the studs. Did you begin designing the track layout before constructing the support structure? I have previously told everyone that 10234 Sydney Opera House was my most ambitious project but I think this one was definitely more challenging. We were developing a track system while developing a product and trying to incorporate Boost which was also being developed concurrently! For instance, we designed some very different layouts to the final model but we were actually receiving test moulds while considering different layouts. As manufacturing materials changed, we repeatedly discovered that the wagon would not go around any more as different plastic materials behave in different ways. In fact, the cooling of the tracks was particularly difficult as that process sometimes caused the track to warp under certain conditions. On that basis, the entire set was designed simultaneously which is probably why it became so difficult. If the tracks had existed already, that would be much easier! Presumably you have been working on this set for several years then? We started designing the tracks in earnest a couple of years ago but conceptually the process has taken a few years ago. It was actually part of an effort to come up with something that would surprise people. After looking at several options, this one was chosen but then we had to think about whether it can be used by all lines. Is it only suitable for roller coasters or can you find other uses for these parts? We have seen that it can be used for many different purposes. Exactly. That was certainly our intent and you could actually use these components structurally in other creations. The clips used throughout the support structure are similarly ingenious, especially around the large curve towards the left of the roller coaster. Yes, that was created by Robert with support from Mike Psiaki and Carl Merriam. There are different versions of the geometry here with these triangular structures and that suited Mike perfectly as he is a fantastic geometer so it was the best combination. We had some alternative Technic structures too but then Robert created this clever clicking system. Without that the model would have been extremely fragile. There would have been a much heavier reliance upon Technic. That was definitely an option and I am not totally adverse to Technic but I think it would have changed the expression. This would have been less of a traditional System model. We were also impressed by the building experience and how the two halves are constructed separately before being united at the end. How did you decide on the order in which different sections would be built? 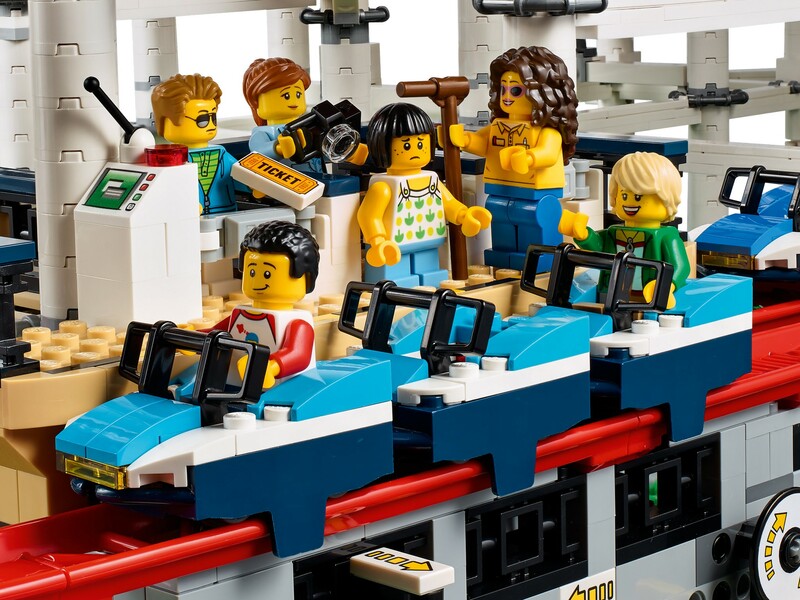 LEGO set design incorporates a great process where we can call upon a group of people, known as 'model coaches', to receive their advice concerning the building experience. They commented on the practicality of showing the entire model in the building instructions because that might make the image very small. The model coaches also thought about building space. Most people build on a table which provides a reasonable amount of space, although not enough for the whole roller coaster. Ultimately, we decided to separate the two halves. That was certainly appreciated. Finally, the model is designed to work with a motor but that motor is not actually included. Why was this decision taken, even if including the motor had meant increasing the price slightly? I believe we wanted to demonstrate the true flexibility of the set. It can be integrated with Boost, Power Functions or even Mindstorms and older systems of motors. We hoped that this model would appeal to LEGO's adult fan base and wanted to acknowledge an entire range of systems, especially since many adult fans might already own Mindstorms or Power Functions components. Of course, they are also available separately and you could therefore motorise the entire fairground together! Many thanks for speaking with us! The second part of our interview encompasses Creator Expert as a whole, including the controversial change from the classic smiling face to more expressive designs in the Modular Buildings! That will be published very soon. Thanks to Alicee for transcribing this interview. Wonderful! Very informative and enlightening article. Pretty impressive how Jamie and Huw are each holding up the built set in the picture by hand - quite a testament to the robustness of the Roller Coaster design! Great interview,great designer, probably most people’s fav I guess? Also well done for asking a tricky question about the power functions. Probably the best interview I’ve read with Jamie. Looking forward to the second part. Interesting timing, I wonder what he could have to talk about tomorrow! Very interesting interview. Lots of great details that wasn't shared before. Good questions too! I like Jamie a lot. He designs such interesting models! Tell Jamie that Your Future President from Brickset approves of his model. Yes. Cause he was waiting in anticipation for my thumbs up. On a Completely different thought, does anyone know how much these guys get paid? Recently with all the set reveals and the delicious new parts to be seen, it occurred to me that those new gear plates from the Pop-Up Party Bus might be another new part that could open up new possibilities for fairground sets... they'd be a neat part to use in something like a teacup ride! Jamie Berard is by far my favourite LEGO designer. I've bought every set he's designed, except the rollercoaster (it's great, but just too big). Great interview. Very interesting to see how much goes into figuring out how to make a set as great as possible. Looking forward to part 2. Not that he would hint at it but curious what else we might see in the future for fairground sets. @Your future president: From my understanding, not an outstanding amount, though there are a lot of expenses they also don’t have to worry about that cut into our disposable income here in the US due to Denmark’s highly efficient public health care system and other government services. 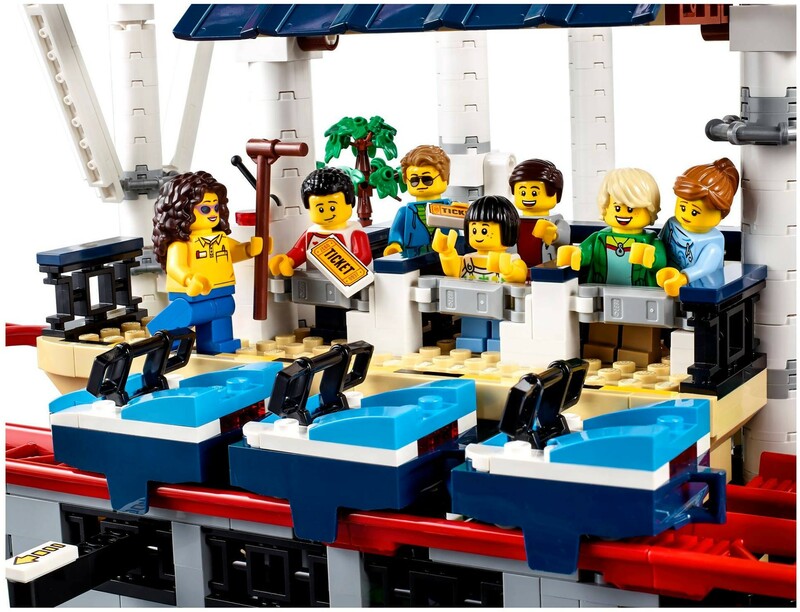 LEGO also has a lot of employee perks that go beyond the paychecks that keep a lot of designers happy working there — at least, those who adapt well to the physical and social adjustments and challenges that come from working in a small Danish town like Billund. @Padraig: If you liked this one, you should also check out the one he did in the latest issue of Hispabrick, where he talked in depth about some other cool stuff like the design process for the Modular Buildings and how feedback from and creativity within AFOL communities has impacted the Creator Expert team’s decision making! Nice interview, but really could have used some editing. It's a bit hard to read in this raw form. Really hoping this is all part of a build-up to the announcement of the next modular building. I think this is the latest into the year we've ever gone without a press release. I like his answer concerning Power Functions. I never understood the complaints about missing Power Functions in that Roller Coaster set. As he said, many of us own already some motors. I am glad that this set does not include Power Functions, since I wouldn’t want to pay for an extra motor and battery box, of which I own already a few. @Brick Dangerous, it has been edited down to about half its original length already! @Huw, I think Brick Dangerous was referring to some very long sentences that could have used more than just transcribing the spoken word - some punctuation, a little less "I think" etc. I don't know how difficult that is with Lego PR, or course. This interview has been edited about as far as it will go. The original transcription contained sentences which ran for entire paragraphs and several of those needed to be cut altogether and rewritten, while still maintaining the same meaning. I am happy to make any clarifications though, if there are specific areas that you think require improvement. Thanks, @ CapnRex101, it's all good. I don't know what these other guys are talking about. The review was perfect. ^ Mainly a couple of missing words, long-winded sentences and missing punctuation. So not really "perfect", but not that big a deal either. I know that longer interviews are a pain to transcribe. Oddly enough I thought the interview could have been longer. To hear so much was cut is a real disappointment, it would be really nice to see it in it's raw form. However from previous comments that @Huw has made I understand that interviews are very time intensive for very little gain in terms of page clicks. I would like to thank the Brickset team for the time spent on this one, which provides a fascinating insight into one of the most talented Lego designers, much appreciated. @Arpie - Very little information was actually cut. The text is probably about half its original length but the sections which have been removed were either repetitious or ineffective in a written form. For example, the section in which Huw and Jamie discuss the support structure underneath one of the bends was originally much longer and contained references to details that you or I, as readers, would be unable to follow. Hello @CapnRex101 thank you for the reply, sorry I didn't mean to come off as ungrateful and I appreciate the explanation. I've never had to transcribe an interview so the process in itself is interesting as well as the content. Excellent article on an excellent topic @CapnRex101! I enjoyed it thoroughly. I haven't made the splash into the Roller Coaster world yet but this article is pushing me towards this purchase. Jamie is an awesome guy. I met him at Brickfair Virginia back in 2010 and he was gracious enough to look at my modular, critique it, and offer praise. When I complimented him about the radiator inside the Green Grocer he was humble and honest enough to tell me that this part of the build was actually designed by someone else. Those of us who love modular buildings are very lucky that Jamie's vision for this product line came to fruition. Articles like these are a true testament to the presence that brickset has forged for itself in the AFOL community. Keep them coming Huw, Rex and the rest of the brickset team!